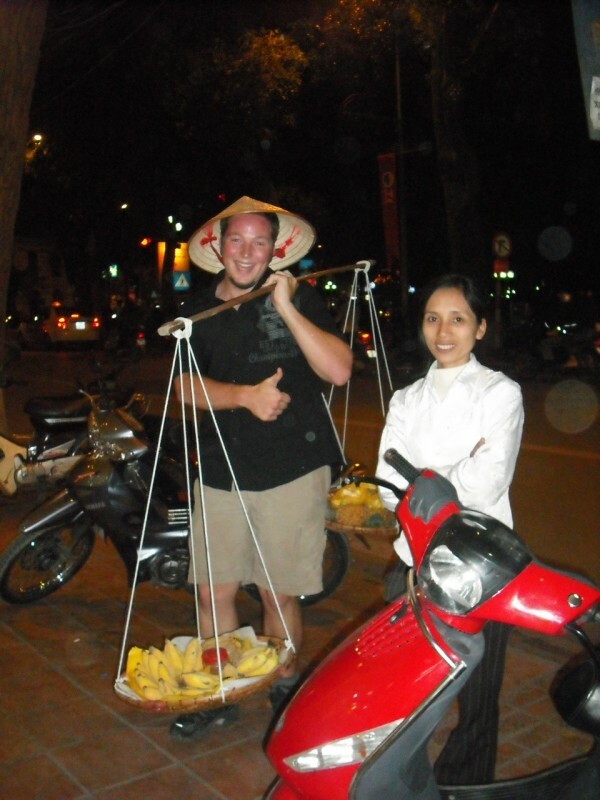 Before coming to Vietnam we've heard many people say that they absolutely HATED it. And will never go back. They say the people there are rude and they had a horrible time. Then others say they LOVED it. And can't say enough good things about it. William and I have been here for about a week and really like it here. The people are really friendly, the food is good, and stuff is cheap. Now, there are some things here that I would have to get used to if I were staying long term. For instance, people stare at you here. I don't mean you see them staring at you out of the corner of your eye and you look at them and they look away, I'm talking you see them stare at you and you look at them and they KEEP staring at you. It's so weird. But usually if you just nod your head and smile they'll do the same in return. It's just a thing that they are comfortable doing here - staring at you. Also, personal space is non-existant here. I'm already used to being close to people on buses and things after spending so much time in Guatemala, but here they take it a step further. They're "all up in my business." I'll be just working away on my computer - editing a video, or programming code and some guy will come up from behind me and just stare at my computer screen. He doesn't even try to be covert about it. I always stop and look at them as if to say, "Can I help you?" But they just keep staring at the screen. The first time it happened, I thought it was just a nosey guy, but it's happened over three times so far. Must be another culture thing. We've found a little town that doesn't see many tourists. We stayed at this hotel and everyone treated us like a celeb. They even took pictures of us with their cell phones. Of the entire hotel staff, there was one person that could speak a little English. To order our diner, we drew pictures of a pig and a cow and some rice and noodles. It's quite an effective way to order food. When we got our food (which was soup with pork and beef) we started eating with chopsticks and everyone was staring at us and laughing. Then one came over and showed us how to eat the soup "properly" by using the chopsticks to put the noodles on a weird looking spoon. You could tell they were really excited to have us there at their hotel. Everyone here is so nice and full of smiles - what's not to like? I'm LOL at your post yet again. The staring and non-existent personal space is especially true in Asia. Have you been touched, er, pet yet? Seriously, when we were in the Philippines and Indonesia people actually came and stroked our arms and/or heads. We're Filipino so I'm guessing it's because we're so much fatter than everyone there. Well, that, and the fact that we were traveling with an African American friend of ours got us a lot of looks and pets. But it's all good as it's all part of the experience. Thanks for always providing such entertaining posts! Congrats on the win Sam and William! Your fried fish episode reaffirmed for me why I detest fishy things. I'm from KY. A friend just posted your site on facebook. LOVE IT!! I have friends in Brasilia, Brazil, Havana, Cuba, Cienfuegos Cuba, Ukraine, United Ningde China (close to Fuzhou) and I have other connections in Shanghai China, Venezuela, Peru, and Ecuador. Let me know if I can set you up with a meal or a night to stay. I don't know about you, but I get the petting, staring, pics w/ camera phones every day, here! VIP is my middle name! JK...congrats on the celebrity status!!! i cant stand vietnam. i will never go back. rude people. crappy food. annoying place. but the scenery is pretty. Hey guys! first time here in your blog, i've gotta say it's GREAT! really nice job, i travel a lot too, and i loved vietnam, what a great place. What a great decision u made going to Chile, that's my country by the way, well.. have fun guys!! tourists overlook the desease aspect of Vietnam.If the travelers to Vietnam knew how desease infected the food they eat there and how many major deseases are there all the time and the government covers this all up so they don't scare the tourists away from traveling there.you may spend a couple of weeks there and enjoy it but always remember that you are likely taking at least a parasite or two home with you -and possibly a life threatening desease.I have lived in Vietnam for a few years and am glad to have gotten out alive.Vietnam is a stinking filthy breeding ground for many serious deseases and should only be traveld if you can find no where else to go--do your self a favour and stay away from Vietnam.